One of the attractions of taking up running is that even if you can't afford the gym fees or the time to learn how to use any specific equipment, all it takes is a pair of trainers, some stretching exercises and your course lies beyond the front-door step.However, while running the streets is a cheap and very convenient way to embark on training, the very fact that they are so accessible can lead to certain safety issues arising. Let's start with an invisible element that is particularly relevant for city dwellers surrounded by busy roads: pollution. Unless someone's motor is suffering exhaust problems, the carbon monoxide it is pumping out cannot be seen. But it is there, hanging in the air, along with the by-products of many more car engines. Of course, it represents one of the accepted hazards of city life. The problem for the runner is that they are breathing more deeply than someone strolling down the road, and with each deep breath, the polluted air is absorbed more deeply into the lungs. Short of making the roads a car-free zone, there is never going to be an ideal resolution of the problem for the runner. But it is possible to give the lungs a bit of a break by timing runs for a time of day when the traffic is not so busy, for example early in the morning or after the evening rush-hour. Another idea would be to stretch the legs in a brisk walk to the nearest park or green space where the traffic fumes will not be in your face to the same degree. Green space does share one hazard in common with the streets: the risk of attack. When this subject is broached among groups of runners it is all too often assumed that the most vulnerable group is women. To some extent this is true, in part because women often do not pack the muscle power to repel an assault, but if an assailant is wielding a weapon, you can be a 16 stone and six foot three male and still not be immune from attack. The most obvious protection from attack, or even the casual abuse of groups of youths that can put some runners off taking to the street, is to find a partner or partners. In short, safety in numbers. 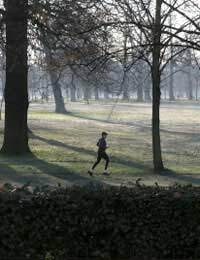 But if you are venturing out on your own, it is sensible to restrict running to daylight hours. If the pressure of work means you can only run after dark, choose well-lit streets, and take the precaution of telling someone at home, or by phone, that you are going running, expect to be back at a certain time and to raise the alarm in the event that you don't get in touch. Using your eyes and ears to be alert to potential dangers is important so while it is understandable that many runners like to use iPods and other portable music players to make their exercise time more enjoyable, it is advisable to leave the headphones at home. And remember that a music player may make you a more attractive target to an opportunistic thief. Not only that, it will impair your ability to hear traffic, which can be dangerous if your route includes crossing side roads. Pavements by their very nature are not running tracks, which means that even the best maintained are liable to incorporate the odd stretch of uneven surface that can cause ankle ligament damage. Tripping over a paving stone can leave the runner bruised or requiring hospital treatment. So while it is important to watch what is going on around you, don't forget to observe the road ahead so that you know you are always stepping on solid ground. And finally, a word about your fellow pedestrians. Be courteous, and take account of the fact your fast approaching footsteps may make others fearful that you, yourself, are a troublemaker. Be ready to move to one side for people walking towards you, and leave plenty of space when overtaking to alleviate the anxieties of others.